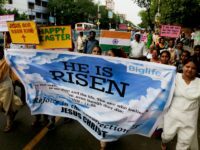 A Twitter user attacked Texas Governor Greg Abbott for his religious faith and asked him why God has never helped him walk again. Abbott has been confined to a wheelchair since July 1984 when a tree fell on him, breaking his back. 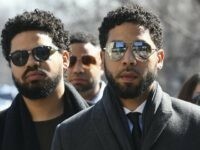 He was running with a law school friend at the time through a neighborhood in Houston. The user’s account has since been suspended by Twitter. The Texas governor was paralyzed from the waist down following the accident that broke his spine in 1984. Abbott has never let the injury get in his way of accomplishment. Following his accident, Abbott became a Texas district court judge in Harris County. He was later appointed to the Texas Supreme Court by then-Governor George W. Bush. He won a statewide election for that position. When then-Attorney General John Cornyn decided to run for the U.S. Senate, Abbott threw his hat in the ring and carried out another statewide win to serve as the State’s top law enforcement officer. After a successful series of terms as the Texas AG, Abbott decided to run for governor and defeated the Democrat icon, State Senator Wendy Davis, and the Battleground Texas activists in a landslide election. Despite the offending Twitter user’s account being suspended, Abbott supporters were quick to respond to the offender and the governor. Fiesty Floridian, @peddoc63, Tweeted, “Even with Governor Abbott’s disability you can only wish to be 1/10 the man he is. You are a very hateful and disturbed person. @dschlick.” She also called the governor a “class act” in how he responded to the hateful tweet. 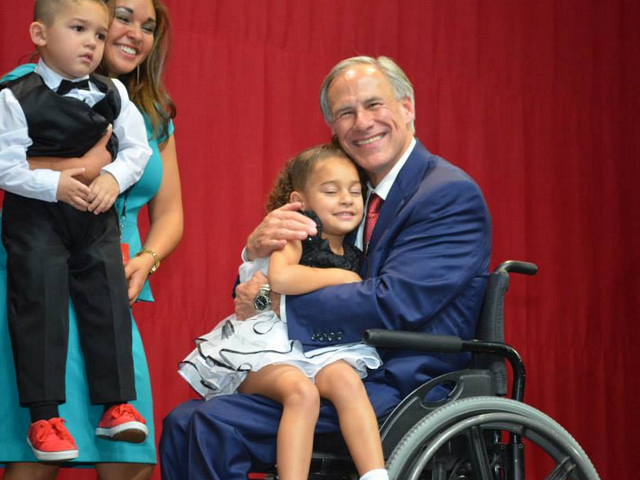 Even with Governor Abbott’s disability you can only wish to be 1/10 the man he is. @GregAbbott_TX @dschlick Merry Christmas Gov. I’m so sorry rude people feel the need to comment. You are very special to Texas. 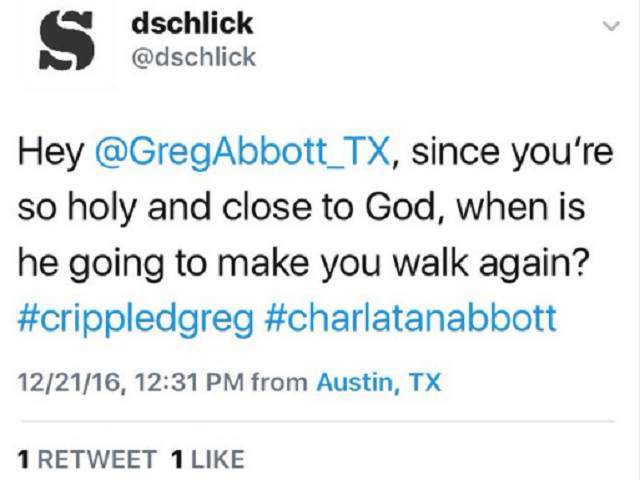 The offending tweet by @dschlick was sent to Governor Abbott’s personal twitter account, not his official account, @GovAbbott. The Texas Governor has written a book entitled, “Broken But Unbowed: The Fight to Fix a Broken America.” Newt Gingrich said of the book, “Taking on and overcoming insurmountable challenges is not new for Greg Abbott, and his plan to restore the Constitution is bold, compelling, and worth a read.” None of the proceeds of the book go to the Governor or to his campaign. The net proceeds from the book sales are donated to Operation FINALLY HOME, a non-profit based in Texas that provides custom homes to veterans and their families mortgage-free.